You might remember in my post, The Sad Truth Behind My Oval Coffee Table that I'm on a mission to give re-makeovers to any furniture that has not sold in over six months. 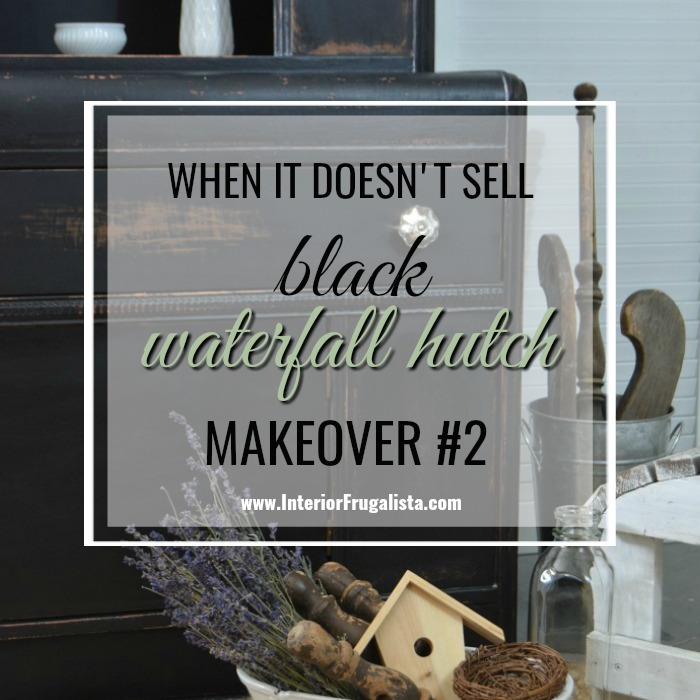 Tired of these rejected pieces taking up valuable space in our basement, I'm happy to report that this Black Painted Waterfall Hutch is the last to receive a second makeover. My new rule - no more furniture allowed in this house until I've given makeovers to the ones in the queue and RE-makeovers to the ones that haven't sold. 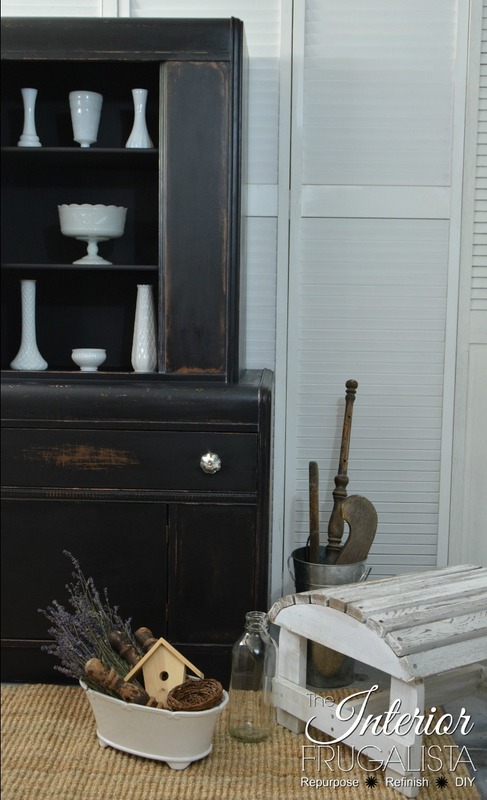 Like the Summer Blueberries Pedestal Coffee Table, my Antique Waterfall Hutch went from market to market but at the end of the day, would end up back on the truck. I also tried selling it in my booth at the antique mall as well as listing it online and while it received loads of interest, not a soul wanted to buy it. So in late December I reached out on my Facebook Page and asked for help. I wanted to know what readers felt was the defining element that prevented potential buyers from pulling out their wallets. Many said the turn off was probably the combination of black and stained wood. 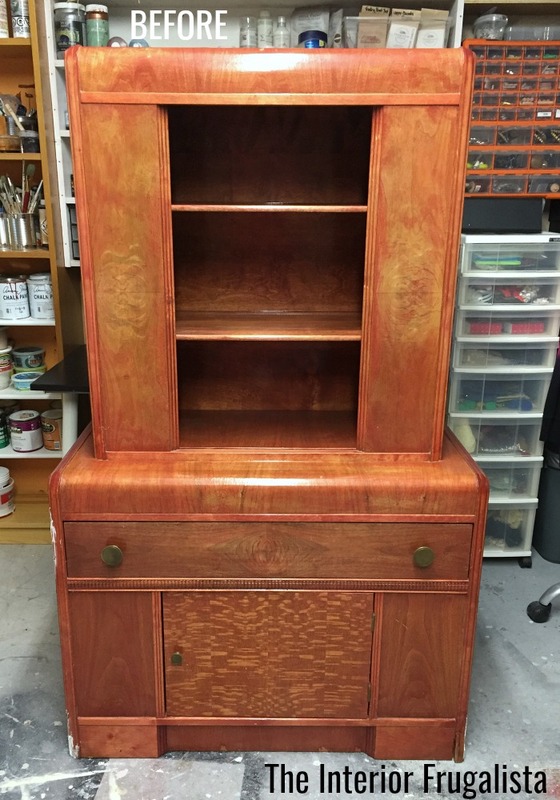 The third most popular suggestion was to paint the cabinet blue. But the most popular suggestion was to paint it white and I get it - white sells. I seriously considered going this option, so much so that I bought the paint. 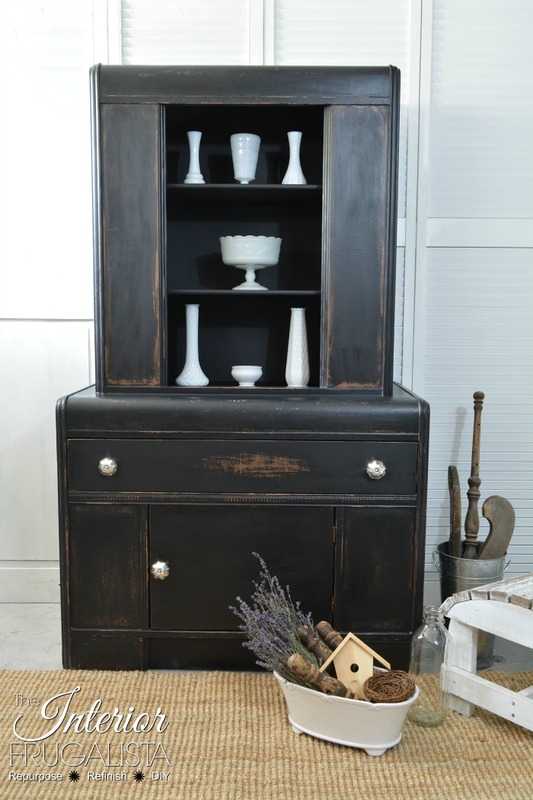 Painting the cabinet ALL black was the second most popular suggestion. After spending months considering my options I just couldn't open that can of white paint because I truly loved the black. I figured there was nothing to lose considering I still had some leftover paint and if worse comes to worst, I can always go over it with white and have a nice base for distressing. I loved it...I loved it a lot. I've included a Materials List towards the bottom of this post. 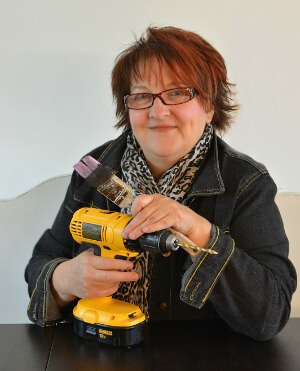 It contains affiliate links for your convenience so you can see what products I used or recommend for this project. What that means is that if you click on one of the product links and make a purchase, I may receive a small portion of any sales at no additional cost to you, which supports the costs of running this site. See my full disclosure policy. I sanded the raised stencil on the lower door and painted all the stained sections of the exterior black. Then I used my mouse sander and went crazy with the distressing. 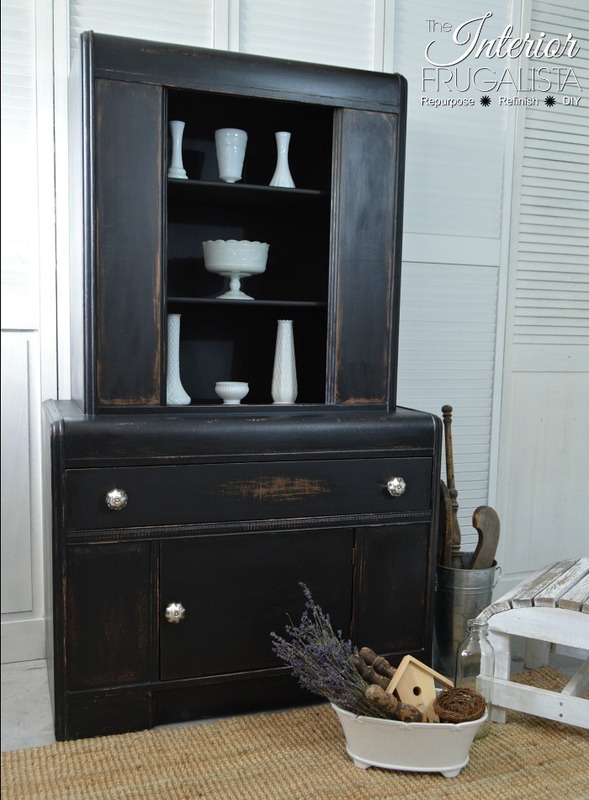 The next decision was whether to keep the top portion of the hutch a creamy white or paint it black. Black won again. 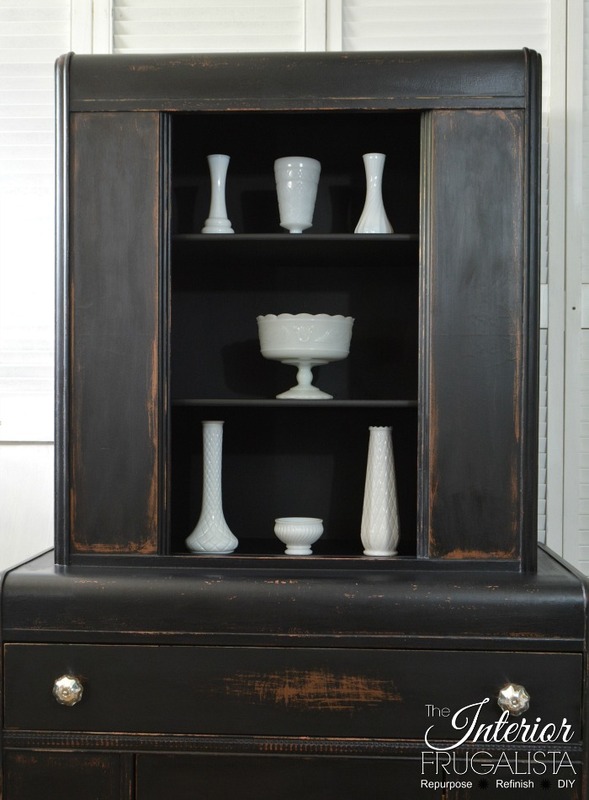 I love how my white vintage hobnail and milk glass collection pops against the black. 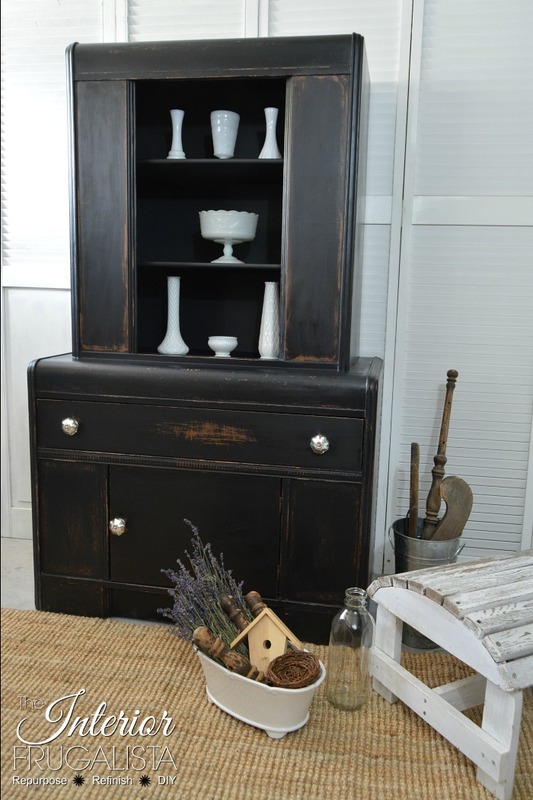 Vintage Ironstone would look amazing on display too but so would any color that offers a contrast and pop of color. I changed out the clear glass knobs for some pretty mercury glass bling and I love the contrast. 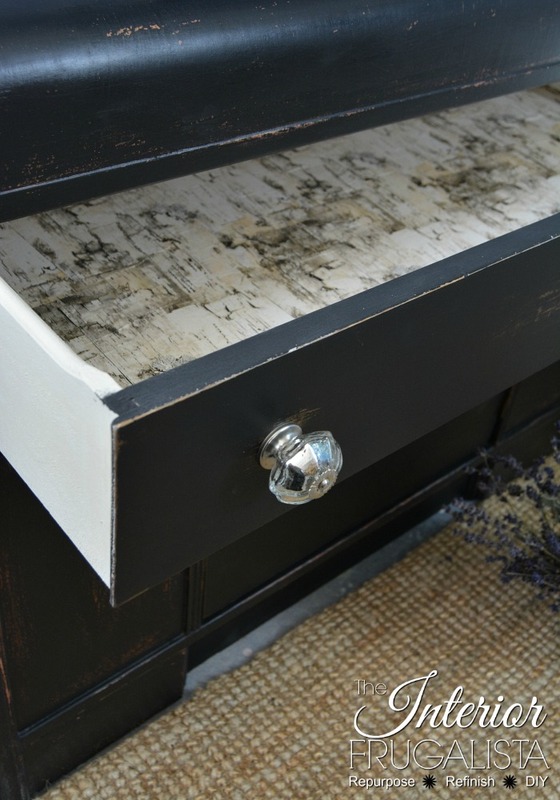 Even the drawer got a new makeover by changing out the contact paper with birch bark wrapping paper. 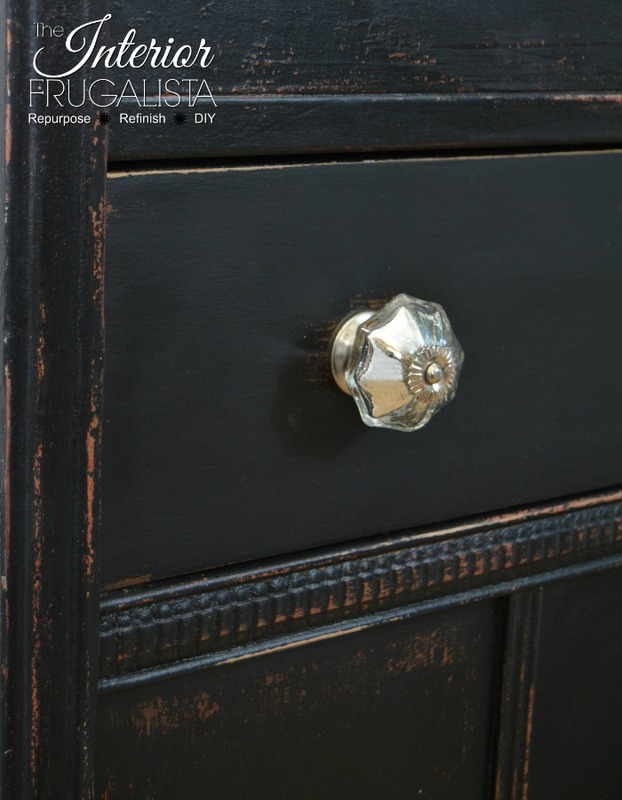 I always use wallpaper paste to line drawers because it provides more adjustment time and creates fewer air bubbles and wrinkles. To deepen the black I applied Daddy Van's Shadow Black wax and just love how rich it made the color. I think the Art Deco Waterfall Hutch has such a classic look now with a Farmhouse twist and I'm thrilled with the results. Let's compare the first makeover with the second, shall we? 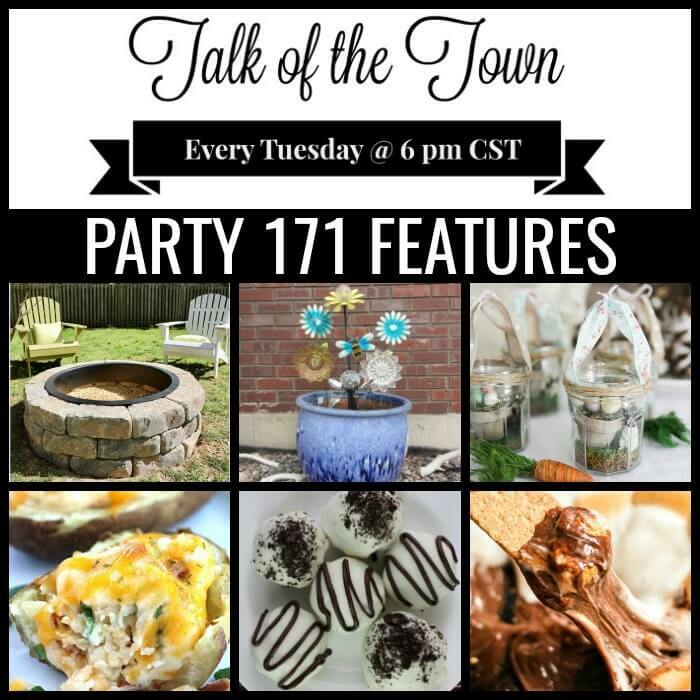 I'm so anxious to hear what you think. And for the fun of it, this is what the waterfall hutch looked like before the first makeover. 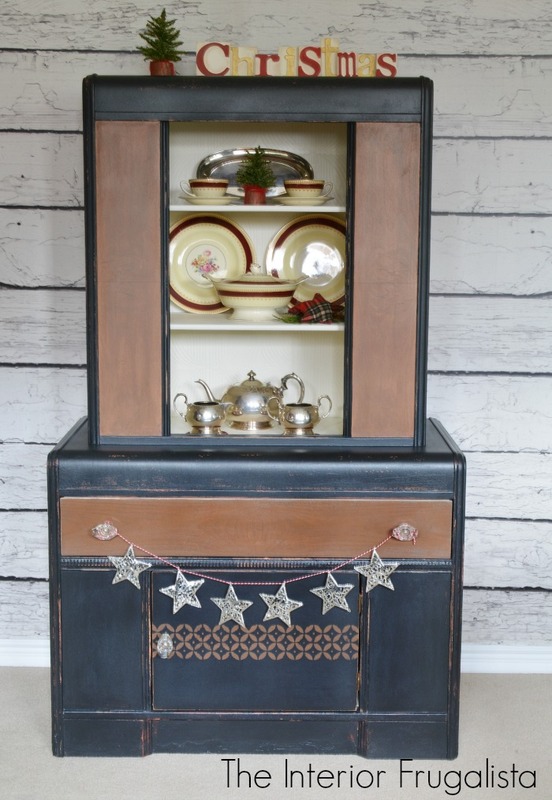 This is why I love what I do; breathing new life into sad vintage furniture and REloving it into our living space! 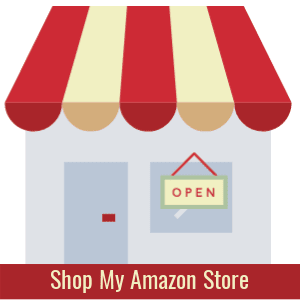 Products without a link can be found in my Interior Frugalista Shop on Amazon. So what do you think? Did I make the right choice? Don't be shy, I'd love to hear about it in the comment section below. 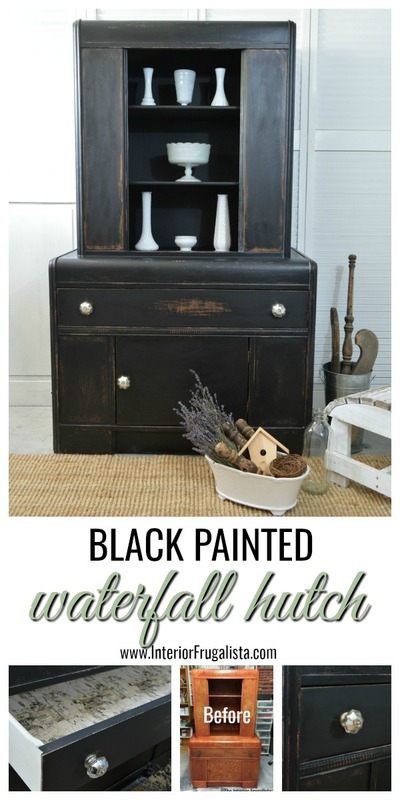 If you like my Black Painted Waterfall Hutch Re-makeover, please share it with a friend and/or save it on Pinterest. 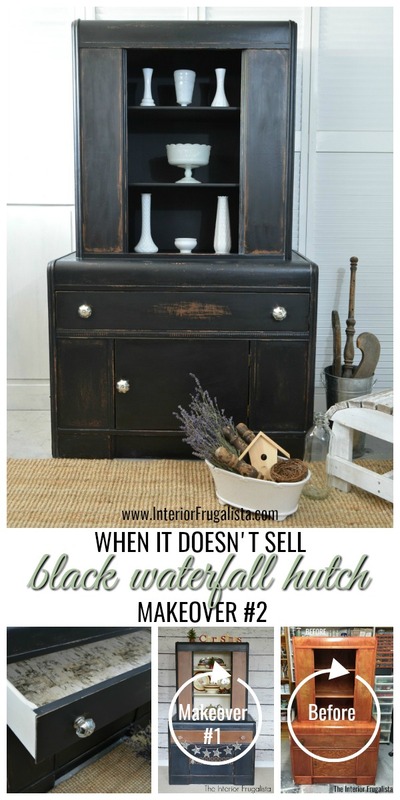 If there is anything to be learned from these two waterfall hutch makeovers is that you can't ruin a piece of furniture with paint. If you're not happy with the first attempt, go back and tweak until it speaks. 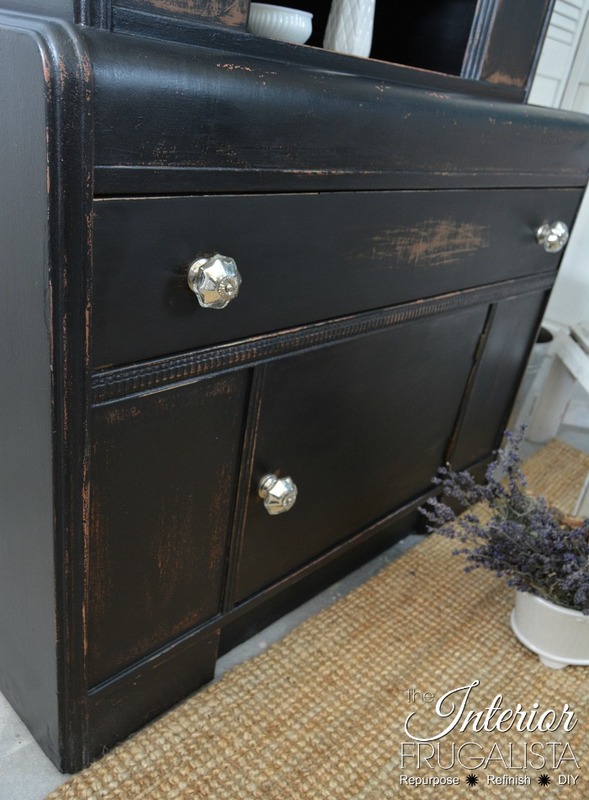 This isn't my first black painted furniture rodeo, here are some other furniture makeovers that I painted black. Like this handcrafted scalloped table but guess what? I didn't use black paint. 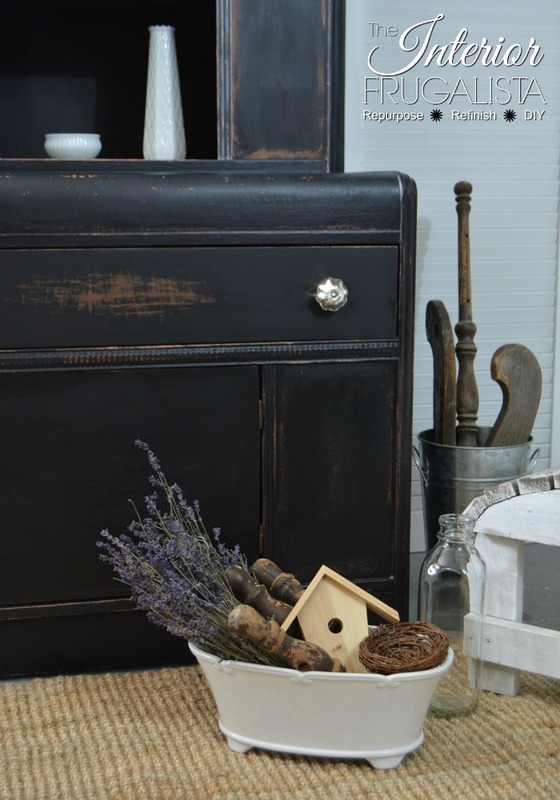 This black painted Old World Map Coffee Table was decoupaged with wrapping paper. Recently I used plastic inlays to stencil this Black Bird Coffee Table.